I love this quote, it made me feel that Dash was a character created especially for me. At the stage of my life when I first read this book I felt as if I was the only reader of my generation. 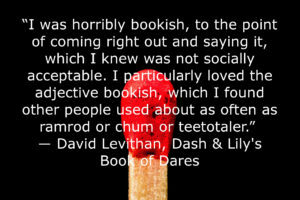 Dash & Lily’s Book of Dares is still one of my favorite books. Do you have any favorite quotes from this book, let me know.